Ready to take your results to the next level? These 7 fundamental fitness tips from the athletes of Team Grenade could be exactly what you need! As you get deeper into your lifting career, it's tempting to think you should always take on more—more exercises, more volume, more advanced training techniques, more extreme workouts, and more weight—to ensure consistent progress. This approach may work for a while, but in the long run it can actually lead to stagnation, burnout, or injury. In this case, instead of throwing more at your fitness goals, it can help to take a step back and return to the fundamentals. 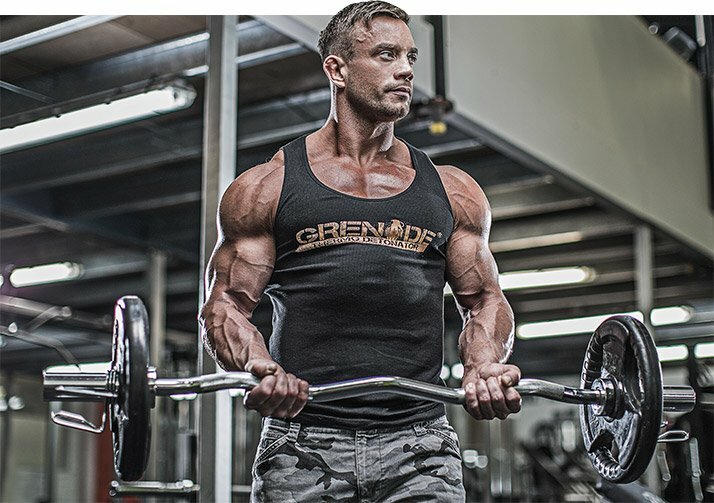 Instead of adding new exercises and quadruple-ultrasets to every workout, remind yourself of the essentials with these time-tested fitness tips from the athletes of Team Grenade. They could be just what you need to make extreme progress. "Form is key before anything else," says fitness model Adam Parr. "Once you've mastered the correct form [of any exercise], you can begin adding weight to the bar each week, progressively overloading the muscle." Too many people add heavy weight on the bar before learning how to execute any given lift. This isn't a way to be extreme; it's just a way to get injured. To really make extreme progress, you have to kick your ego to the curb and perform every movement with precision. Only after you've mastered an exercise can you ratchet up the weight, add training techniques like dropsets, and make progress for the long haul. While reducing the weight to work on form may feel like taking a step backward, it's actually the opposite. Once you nail form—especially on technical lifts like the squat, bench press, and deadlift—you'll be able to add weight every week, target the proper muscle groups, and see the results you've been looking for. If you're guilty of stumbling through certain exercises, check out the Bodybuilding.com Exercise Database before your next workout. Spend time studying and then drilling your trouble spots. Becoming a better lifter now will help you become a stronger, more muscular lifter down the road. Only after you've mastered an exercise can you ratchet up the weight. People often think of growth as a solo pursuit, but if you train alone, you may be leaving gains on the table. A solid training partner can push you the extra mile when you'd rather quit, spot you on uncomfortably heavy lifts, and ensure that you are giving 110 percent each and every time you hit the gym. Accountability and competition are also powerful motivators. If you know your partner is going to meet you at the gym, you'll be less likely to skip a workout. If you know your training partner is stronger than you on certain exercises, you'll probably push harder to keep up. You may even want to surpass your partner's numbers, which can help you power through previously immoveable loads. "You're going to have to be prepared to go to some really difficult places if you want extreme growth," says Parr. "Get a good training partner, and you won't dread it; you'll enjoy going there." People often think of growth as a solo pursuit, but if you train alone, you may be leaving gains on the table. 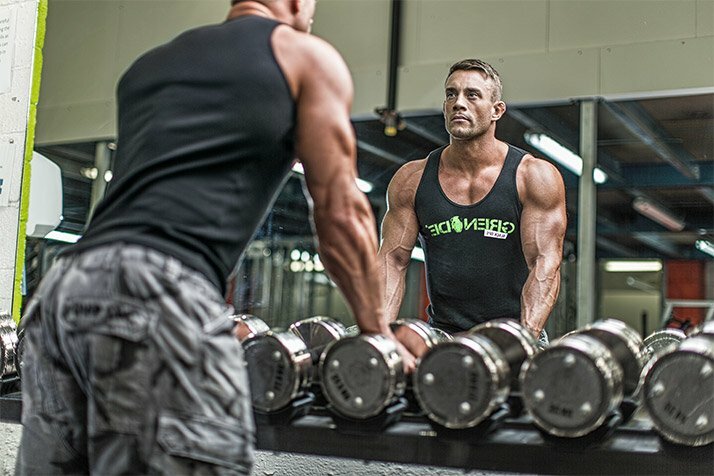 Natural bodybuilder Shane Raymond believes supplements are an essential part of extreme results—especially when timed optimally around workouts. "Supplementation alongside a balanced diet and hard resistance training can really influence progression in muscle gains when used before, during, and after a workout," he says. Raymond uses Grenade's .50 Caliber pre-workout supplement to support his training energy, muscular endurance, power output, and focus. He likes to sip on amino acids during his workout to reduce muscle protein breakdown, followed by Hydra 6—a mix of whey and casein protein—post-workout to kick-start recovery and growth. Raymond's simple-but-smart supplements—taken before, during, and after each workout—prepare his body to work hard every time he steps into the gym. They also help ensure his body continues to recover and grow after every session. 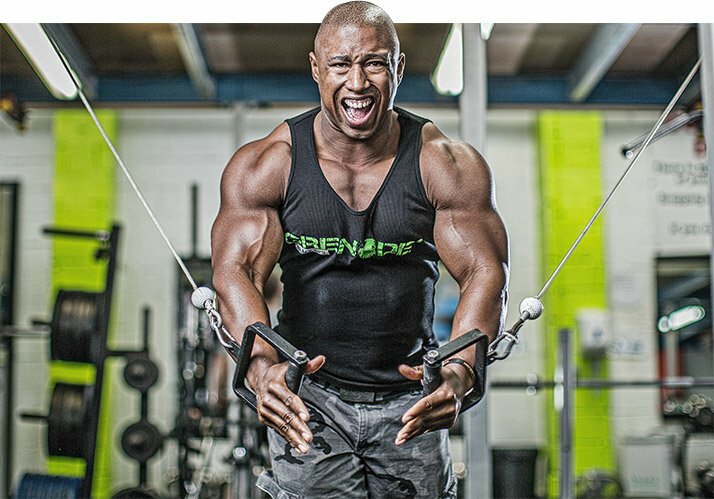 Natural bodybuilder Shane Raymond believes supplements are an essential part of extreme results. Part of long-term growth is hitting your muscles with new stimuli. Your body needs to adapt to new forces, so you can't always rely on the same movements and techniques to work forever. Adam Parr likes to frequently change up his workouts, seeing what he can get his body to handle. This not only ensures that you're making constant progress, it's also a great way to ensure that you don't get bored. If you aren't mentally stimulated in your workouts, it'll be hard to really push yourself to the max. 24g of Protein to Help Prevent Muscle Breakdown and Provide Great Gains in Lean Muscle. Go Now! "Vary your exercises, tempos, and range of motion," suggests Parr. You don't have to completely overhaul your workouts every time you hit the gym, but it helps to make slight adjustments to fundamental exercises. If you've been hitting the regular bench press for a long time, try slow negatives with a wide grip, or partial reps at the top of the range of motion. 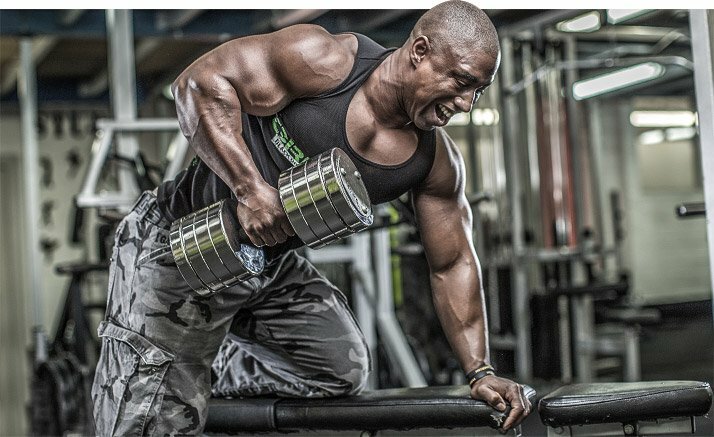 If you want extreme results, you need to be patient—especially when it comes to building size. "If you're looking to gain size, you need to learn it won't happen overnight," instructs Parr. "Make sure you're eating a calorie surplus of 500 or more calories per day, and your weight will increase, given adequate time and training." Parr also notes the importance of consistency. "Use the 80:20 rule," he says. Make it a habit to eat clean 80 percent of the time and "cheat" in moderation the other 20 percent. This is the level of dedication needed to see extreme change, and you need to remember that extreme change won't happen in a period of days or a few weeks. Your body does what your mind tells it, but when many trainees head to their workouts, they start lifting before really focusing on the task at hand. Shane Raymond believes this is the wrong way to go, and that your mind should come before your muscle. "The mind is, in my opinion, the most important thing when it comes to getting results inside the gym," he says. Raymond firmly believes that learning how to master your mind is an essential part of transforming your body. He believes your brain gives up long before your body, so you have to control it first. "Never let your mind create your own limitations," he advises. "Just because it hasn't been done before doesn't mean you can't do it." Raymond also suggests thinking about how far you've come rather than how far you have to go. This change in focus can help you reframe your goals so it doesn't seem like you have such a high hill to climb. Your body does what your mind tells it, but when many trainees head to their workouts, they start lifting before really focusing on the task at hand. One thing people often seem to forget is that hard work is essential for extreme results. Instead of working hard to burn fat, many lifters putter at a low intensity on the treadmill. Adam Parr, however, likes to take his cardio to the extreme. When aiming for fat loss, he doesn't mess around. In fact, he often turns to Tabata intervals to really burn blubber. "High-intensity interval training is extremely effective for fat loss," he says. "Try working hard [with Tabata training] for 4 minutes on the rower or bike." To knock out Parr's Tabata workout, simply work at max effort for 20 seconds, rest for 10 seconds, and repeat seven more times! In other words, perform eight 30-second bouts of work/rest for a full four-minute workout. Pretty soon, you'll be watching the fat melt away. Parr also incorporates hill sprints into his training, which are a great way to get out and make the most of your surroundings, especially in the summer months. "Find a hill with a small incline, and sprint for 30-50 meters," he says. "Then slowly walk back for recovery. Do this 10 times in the morning for an extra fat-burning boost!"